Read Receipts allow others to be notified when you have read their messages on an iPhone, iPad, or iPod touch. From the user perspective it displays as a tiny “Read” indicator below a sent message if the recipient has seen the message. There is some obvious benefit to that, but it can also be a bit annoying and even intrusive from a privacy standpoint. Thankfully the read receipts feature is easy to turn off or on in iOS as your own needs determine, so we’ll show you how to do that. Obviously iMessage needs to be configured and working in iOS to have this option in the first place, since Read Receipts are not delivered on standard text messages. New messages received on your iOS device will no longer show ‘read’ and a date, instead they will simply show ‘delivered’ and a date if sent through iMessage, or nothing at all if sent as a text message. The ability to toggle read receipts on and off is available in all versions of iOS as long as you have iMessage configured, which most users do. In some versions of iOS the settings may look a little different, but the feature and disabling or enabling it works the same regardless. Read Receipts can also be turned off for the Mac iMessage client if desired. 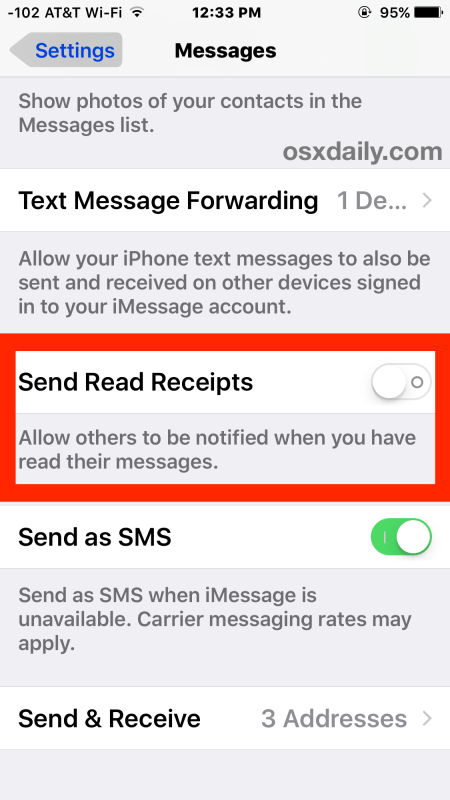 You can re-enable the Read receipts at any time with iOS by going back into Settings > Messages > and flipping Read Receipts back to ON. There is no way to selectively enable Read receipts on a per-contact basis, though that would be a great feature for future versions of iOS Messages. It’s important to point out the effect this has on what the sender sees, they will see a “Delivered” notification rather than a “Read” notification. This basically indicates the iMessage was successfully sent through Apple’s delivery system, but it doesn’t offer anything beyond that. As of now, there is no way to turn off that “Delivery” notification while still having Messages work for iMessage delivery. There is no way to turn off both the “Read” receipts or the “Delivered” notification in iMessages without disabling iMessage completely. Turning off iMessage is easy, but it will prevent people from Macs, iPads, and iPods from being able to send you messages, since it causes SMS (traditional text messaging) to be delivered only. Obviously you’ll want a healthy messaging plan with your cellular provider if you choose this option, and if you want to do that, open Settings > Messages > and toggle iMessage to OFF. This is not recommended. How do you disable the typing notification “…” in iMessage? It turns out there is no way to disable the currently typing notifications, which appear as a “…” to the other individual in the iMessage conversation any time text is being entered. This seems like a simple feature oversight, and it would be surprising if this was not remedied in a future update of iOS with an added toggle to be able to switch those typing indicators on or off through a privacy setting. The only way to disable those typing notifications would be to turn off iMessage completely and rely on SMS/texts instead, which is generally not recommended and typically undesirable. Read receipts can ultimately be deceptive, and they will show as Read simply if the message was opened even for a brief second, just by doing something like tapping the Messages app, which defaults to going to the newest message. Obviously this isn’t a legitimate indicator of a message being actually read, and if you’re busy or trying to text someone else, those indicators will get sent even if you haven’t actually acknowledged some new iMessage through the Messages app. Turning this feature off can eliminate some miscommunication or the feeling of a sender that they’re being ignored, because let’s face it, sometimes messages come across and we don’t actually read them because we’re busy doing something else, despite the app being briefly opened.